Hamby Home(in)stead ...: Chook Heaven! Our weekend definitely had a grow-your-own theme - after Saturday's Harvest Festival, we attended an open day at Seven Hills Organic Farm on Sunday! The event had been cancelled the previous weekend due to bad weather but we had lovely sunshine for our visit. It was a brilliant day and one that will be long-remembered! We enjoyed all aspects of the tour but without a doubt, the highlight for all of us was seeing the 350+ free-range chooks roaming as they wished, safely confined within the bounds of a 5-acre, fox-proof fence - with additional protection from Joey, the Maremma dog. What a sight! 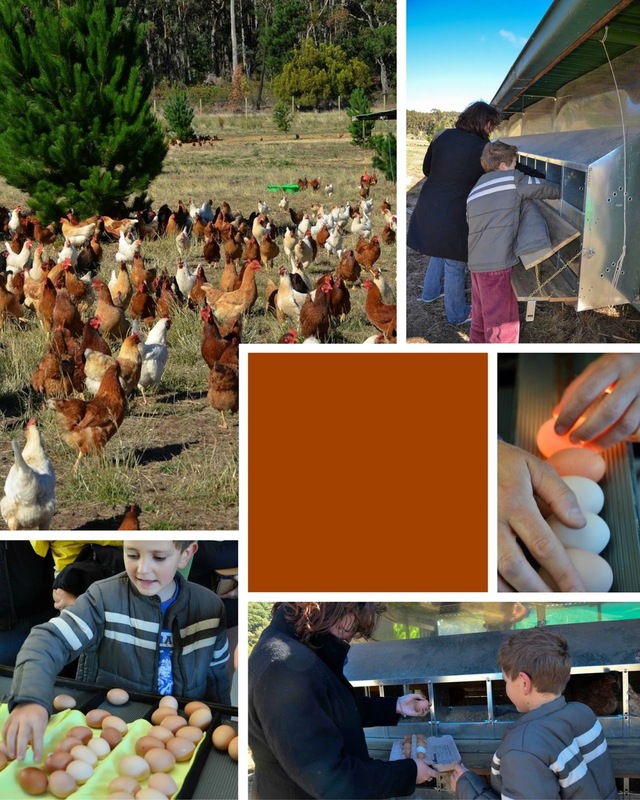 Josh's Rainbow Eggs are sold locally, with 20 dozen collected daily from the happy hens. As part of our tour, we were able to collect eggs ourselves, from one of the huge "chook tractors" within the fenced enclosure. Both Erin and Vaughan were equally thrilled by finding warm eggs - in fact, Erin was a little miffed that Vaughan had collected more than his fair share of our carton! Hopefully their excitement at egg-collecting will continue indefinitely because we were gifted four of Josh's older hens at the end of the day, to enjoy retirement at Hamby Home(in)stead! Whenever Vaughan sees a group of something en masse, he terms it "... heaven" - and the description was very apt for these chooks. Not only were there hundreds but they really had a wonderful life, safe from foxes, eagles and crows - free to express their "chicken-ness"!